Unless you opt for laser removal at some point in the future, a tattoo is for life. The size and shape of your various muscles, however, are unlikely to stay the same throughout your lifetime. When considering tattoo placement and design, it is important to consider whether the tattoo is likely to stretch with changes in your muscle tone and size. The website BodyBuilding.com says that your tattoo is unlikely to get stretched out with the accumulation of body mass, unless it's in an area where stretch marks appear, such as around the armpits. When it comes to tattoos and bodybuilding, the website also states that a difference of a few inches of circumference in muscle bulk would be apparent, yet the difference that would make in the look of the tattoo would hardly be perceptible. Tattoos as a form of body art have a history going back many centuries. In the early 20th century, tattoos in Western society were most typically associated with members of the military — especially the Navy — and criminals. However, since the early 2000s, there has been a democratization and huge increase in the popularity of tattoos. It is now acceptable to find tattoos on a person from any socioeconomic class, profession or gender. If you're getting arm tattoos, you may be wondering, Will my tattoo stretch if I lift weights? When tattoos are placed over a muscle, the tattoo may stretch if you subsequently increase the muscle mass in that area. 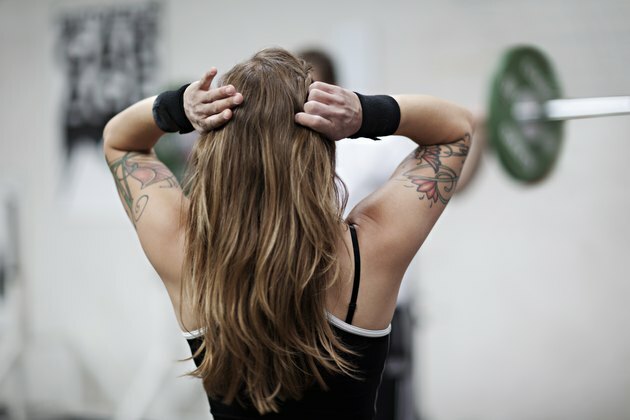 Moderate muscle growth should not have any noticeable effect upon a tattoo. However, sudden or significant muscle growth may damage the design and ink of the tattoo. If you develop stretch marks from the sudden gain of muscle mass or weight, they may destroy some of the ink in your muscle tattoo. According to an article in Medical News Today, pregnant women often develop stretch marks on their hips, thighs and stomachs, and this may change the appearance of a tattoo. This article considers the effects of tattoos while women are pregnant or breastfeeding, although the same issues of stretching and distortion of tattoos would also occur in areas of pronounced muscle growth. If you want to minimize the risk of a tattoo stretching due to muscle gain, make sure to have it done at a time when your muscles are at the size you expect them to be in the future. If you are already a bodybuilder, wait until you have reached the optimum muscle mass you are aiming for before placing a tattoo on your muscles. You should also be aware that a tattoo on a muscle will be prone to shrinking if you cease working out or weightlifting after the tattoo is placed. Although tattoos are increasingly common in Western societies, many employers require their employees to show no visible tattoos at work. Before you get inked, consider whether a visible tattoo may negatively affect your employment prospects. In one survey by Salary.com, 76 percent of respondents thought that tattoos and piercings could hurt an applicant's chances of being hired. Furthermore, keep in mind that according to an article published by JSTOR Daily in September 2017, tattoo ink is not regulated or approved by the U.S. Food and Drug Administration because it's considered to be a cosmetic item. BodyBuilding.com: Iron And Ink: Your Guide To Tattoos And Training! Medical News Today: Can You Get a Tattoo While Pregnant or Breastfeeding? USA Today: Will Your Piercing or Tattoo Prevent You From Getting Your Dream Job? JSTOR.org: JSTOR Daily: Why Doesn't the FDA Regulate Tattoo Ink?